Chang, C. Y. (2017, April). Science Edu-Communication: A New Adventure. Invited Seminar: College of Education at The University of Texas at Austin, USA. (April 26-28, 2017). Chang, C. Y. (2013, March). Developing Pre-service Science Teachers’ Ability in Integrating ICT and Teaching. Invited Seminar: The Department of Curriculum and Instruction at The University of Texas at Austin, USA. (March 15-22, 2013). Chang, C. Y. (2008, November). The Good, the Bad, and the Ugly (or the Beauty) in conducting interdisciplinary research: A personal journey. Invited Seminar: The Center for Science and Mathematics Education at The University of Texas at Austin, USA (November 5, 2008). Chang, C. Y. (2008, April). 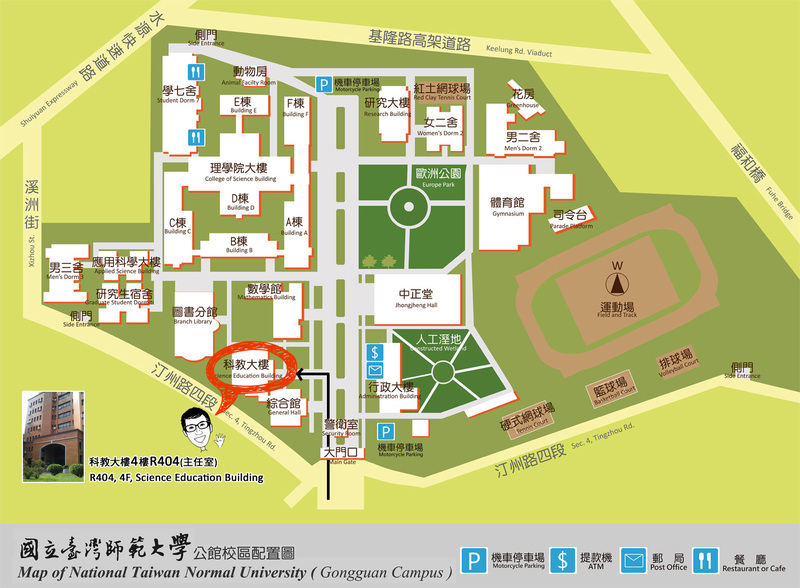 The science education program and recent development on national e-Learning research in Taiwan. Invited Seminar: The Division of Research on Learning in Formal and Informal settings, National Science Foundation, Arlington, USA (April 2, 2008). Chang, C. Y. (2008, January). The science and technology educational model of Taiwan. Invited Keynote Speech: The academic community of Universidad Metropolitana (UMET), Puerto Rico (January 23, 2008). Chang, C. Y. (2007, September). The many faces of special education for the gifted in science: Taiwanese status quo. Invited Speech: The 3rd APEC Forum for the Gifted in Science, Changwon Exhibition Convention Centre (CECO), Gyeongnam, KOREA (September 10-12, 2007). Chang, C. Y. (2006, June). Deep time research in Taiwan. Invited Speech: Deep Time International Workshop (DTIW) held at University of Exeter, United Kingdom (June 20-22, 2006). Chang, C. Y. (2006, June). Curriculum guidelines, instructional materials and evaluation tools associated with natural hazards education in Taiwan. Invited Speech: The International Workshop on Education for Natural Disaster Preparedness and its Implementation Mechanism in the Context of ESD held at the National Institute for Educational Policy Research of Japan, Japan (June 12-16, 2006). Chang, C. Y. (2004, November). Exploring secondary Earth science teachers’ perceptions toward goals of Earth science education and students’ Earth science literacy. Invited Speech: The International Conference on Science Education, College of Education, Chungbuk National University, Chongju, Korea (November 30, 2004). Chang, C. Y. (2004, November). Seeking a shared vision: Exploring secondary Earth science teachers’ perceptions of goals of Earth science education. Invited Seminar Speech: College of Education, Seoul National University, Seoul, Korea (November 29, 2004). Chang, C. Y. (2004, November). Trends in assessing student Earth science problem-solving ability: The importance of domain-specific knowledge and reasoning skills in Earth sciences. Invited Speech: The Seoul Conference for International Earth Science Olympiad (IESO), Seoul, Korea (November 26-27, 2004). Chang, C. Y. (2004, November). Taiwanese Earth science curriculum guidelines for the compulsory grades nine and ten. Invited Speech: The Seoul Conference for International Earth Science Olympiad (IESO), Seoul, Korea (November 26-27, 2004). Chang, C. Y. (2004, March). A roadmap from Earth systems to an integrated science curriculum. Invited Keynote Speech: Special seminar “The practical research related with the educational system based on the international comparative study of earth systems education” held at the National Institute for Educational Policy Research of Japan, Japan (March 24-28, 2004). Chang, C. Y. (2003, September). Taiwanese science curriculum reform and earth system education. Invited Keynote Speech: The 2003 Joint Fall Meeting of The Korean Earth Science Society and Geomorphological Association of Korea, Dajeon, Korea (September 26-27, 2003).